What is a dog head collar? Why use a dog head collar? How does a dog head collar work? Are dog head collars cruel? Editors Introduction: Our guest writer has written us this great article on dog head collars. It’s one of those things you often see but may not know what it was. To add to the confusion – people also call them headcollars or head harnesses. Let us know your experience in the comments section or on our Facebook page. Does your dog make life difficult when you take him for a walk? Does he strain on his collar or harness, dragging you along behind him while you attempt to control him, often in vain? A head collar could be the solution to your problems. In general, there are three main kinds of harness on the market today for dogs. Firstly, those with a connecting clip on the back. Secondly, those that connect to the dog’s chest. Finally, those with connecting clips on both the back and chest for extra control. Harnesses are extremely effective when it comes to teaching your canine companion to walk with you rather than ahead of you. They also transfer pressure away from the neck and spine to more durable parts of the body. However, if your dog is particularly unruly, you may need more than just a standard body harness. This is where the dog head collar can be a lifesaver. A head collar (also known as a head halter) is a specific type of collar harness that attaches to your dog’s snout and head to give you added control over him when it’s time for walkies. In the case of most head collars, an attachment fits securely around your dog’s snout. This is followed by a second attachment that clips behind his head. These are then clipped to your dog’s collar before his lead is attached to a ring below the snout. Your dog should still be able to open his mouth enough to eat, drink and pant with a head collar on, and it should not cause him any pain or discomfort. They are regarded as an effective way to train a dog to walk calmly alongside their owners, without pulling on the lead. In the same way that a halter and lead ropes can help a rider guide his horse, a head collar can assist a dog owner in managing his or her dog when out for a walk. Dogs move in the direction their heads are going, so if you can control the head, you will be in control of the rest of the dog – if the dog can’t move his head, he can’t pull or strain on his lead. With a head collar fitted, the dog should be completely under the control of his owner. In general, when a dog has become accustomed to wearing a head collar, he will no longer attempt to pull on his lead – once the collar goes on, the dog loses the desire to fight the person walking him. This is nothing to do with fear (or at least, it shouldn’t be), it’s just simple association. For example, when you say the word “walkies” to your dog or hold his lead up in front of him, he’s likely to go berserk with excitement, and if he’s properly trained with a head collar, he’ll immediately calm down once it’s been fitted. That’s not to say, however, that just because the collar’s on your dog won’t have an occasional lapse in obedience. After all, a cat in the distance simply has to be chased, and an intriguing smell just off the path must be investigated immediately. It’s possible that your dog could still suddenly bolt into a sprint, even with a head collar fitted, and will find himself coming to an abrupt stop once the lead reaches its full length or the owner presses the stop button. Fortunately, dogs are designed to have strong necks capable of withstanding unexpected changes in pressure that would send a human straight to the hospital. Of course, it would be unwise to let your dog get into the habit of bolting to the end of his lead only to be snapped back too often, as this could cause long-term damage to his neck or spine. But if it happens occasionally and unexpectedly, he should be ok. 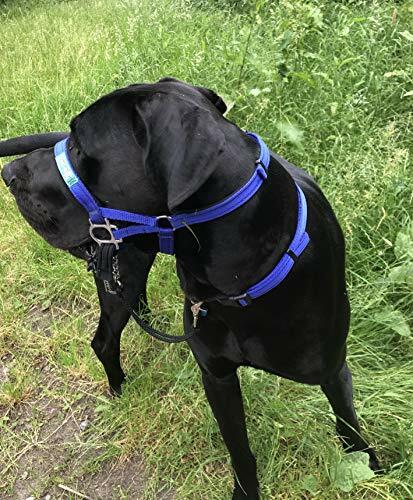 If your dog is unruly when out for a walk or you find yourself with aching arms afterwards because he’s tried to drag you all the way, it would be worth trying a head collar – it could be the solution you’ve been looking for. Head collars/halters work as you might expect. When your dog has one fitted, he will feel pressure behind his neck and around his snout when he pulls on his lead. As soon as he stops pulling, the pressure will release – he will quickly learn to behave in such a way that stops the thing he feels around his head and muzzle from tightening. However, it’s a good idea for a dog owner hoping to acclimatise their pooch to a head collar to reinforce the negative aspect of the device (the increase/decrease of pressure) with a positive facet. Dogs respond much better to positive reinforcement than the negative variety (any owner who has yelled at their pup for weeing on the carpet can attest to this because the dog will only learn to do it covertly next time to avoid punishment). This behavioural conditioning can be achieved relatively easily – just give your dog a little treat when he responds in the right way to pressure exerted by his head collar and be generous with your praise. In all cases when training a dog to use a head collar, ensure that any action you take is performed gently but with enough firmness to show that you’re the boss. A delicate tug that barely registers with your dog won’t do the trick, and a yank that causes him pain will only create a detrimentally negative association. You’ll know your dog better than anyone, of course, so weight up how much force to apply when correcting his walking behaviour – a Great Dane may need a bit more welly than a Chihuahua. 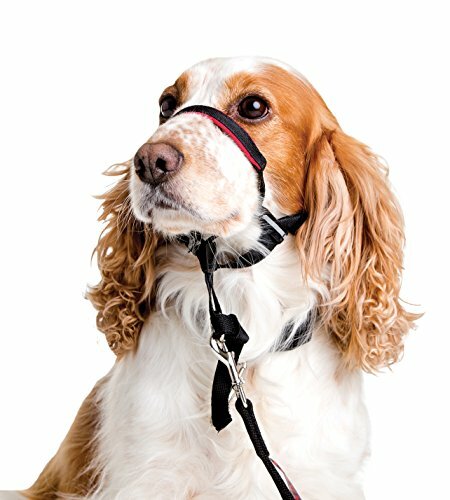 Training your dog to walk calmly by your side with a head collar on isn’t something you’re going to achieve overnight, unless you have a particularly compliant canine friend – personally, I know that one of our two dogs would be reasonably willing to wear a head collar and the other would outright refuse, but every furry friend is different. There’s a very simple principle you need to know about how a dog’s brain works when trying to train them to do anything involving a lead. When you apply pressure on your dog in one direction, he will instinctively exert pressure in the opposite direction. So, when you pull on your dog’s lead and he feels that pressure on his neck or body, his natural reaction is to strain the other way, hence why some dogs end up dragging their owners behind them during an afternoon stroll in the park. It’s something you should also bear in mind if your dog is wearing a body harness and you try pulling him forwards – he will instinctively pull backwards and could slip right out of the harness, depending on its design. Not something you’ll want to happen when walking alongside a busy road. Try using this natural principle for your own benefit when training your dog to walk with a head collar on. Give his lead a little slack when he’s walking by your side to stop him from pulling forwards too much, and similarly, just use a gentle tug to get him moving forwards when you need him to advance; when you want him to slow down or stop, pull the lead forward and he will instinctively slow or stop altogether. You can also make your dog change direction by guiding him the way you want him to go (or what you want him to focus on – you, not the squirrel) with the lead, and can force him to close his mouth if he starts barking or snapping with a sharp tug. You can even encourage your dog to sit by pulling the lead upwards and forwards. A common concern among dog owners is that head collars are cruel, likely to cause injury or discomfort to your dog during a walk. If fitted properly, a head collar is not a cruel option in dog training. However, as with most training tools, it can certainly cause a great deal of undesirable irritation to your four-legged friend if misused or fitted incorrectly. Head collars/halters are not designed to hurt or cause distress to your dog – the opposite can even be true, in most cases. You should not, however, think that your dog will accept the head collar straight away. You should never allow him to paw it off by himself, otherwise, it just becomes a negative sensation that he’ll always want rid of immediately. Make sure the head collar fits properly (not too tight, not too loose – being able to fit two fingers underneath the head strap is normally the golden rule); make sure fitting you associate it with something positive, like praise and a treat; and keep training sessions fairly short and relaxed so that your pupil doesn’t get bored or distressed. In some cases, a dog won’t take too kindly to a new, restrictive device being fitted to his head (would you, in fairness? ), and will resist training attempts. This can be discouraging and stressful for owners, but there are a few things you can try to make the process easier. As with all new things, start off by allowing your dog to inspect the head collar before it’s fitted. A few moments of sniffing can help ease those canine fears and suspicions. You can also try holding a tasty treat at the nose ring to encourage him to slip his snout through it without too much resistance, though you’ll probably have to try this a few times before he gets used to it. The more you do it, however, the stronger the positive association will be. You can also try fitting the various straps of the head collar separately rather than all at once to avoid an overload of new sensations for your dog. Try attaching the neck strap first a couple of times before fitting the snout strap as well, and ensure that both straps are fitted in the right away. Though it’s a good idea to keep training sessions short and light, you should increase the time your dog has his head collar on slightly during each session to keep him progressing. Give him a treat before, during and after the session to reinforce them as ‘good’ times spent with his owner. Once you’ve mastered having the head collar fitted on your dog without him trying to get it off, you can attach the lead. However, start off by letting it trail behind him and work at distracting him with a game or treats while it’s on so he doesn’t notice too much. Keep him focused on you with lots of talking, constant praise, playing with toys and stimulating games. You can try training indoors or outdoors, depending on where he’ll be least distracted. Work your way up to having the lead in your hand and start to gently but progressively apply some force to guide him. Finally, never take the head collar off when the dog is trying to do so as well. If he thinks that pawing at it will result in it being removed, he’ll only do it more often. Use gentle tugs to encourage him to stop if he starts pawing, or ease the session to a close sooner rather than later if he keeps doing it. Work with him rather than against him and take things slow if need be. Again, it’s not something your dog will get used to overnight. Head collars can be exceptionally useful tools for training your dog to walk at a leisurely pace alongside you if fitted correctly and accompanied by proper training. They come in a variety of styles, sizes and costs, so take your time to research thoroughly before buying and go at your dog’s pace when training.